The 70-meter antenna at the Goldstone Deep Space Communications Complex in the Mohave Desert in California. This complex is one of three comprising NASA's Deep Space Network. Like the knees of many other middle-agedworkers, the joints of the enormous Mars Antenna need replacing. The giantradio dish is a crucial element of NASA's Deep Space Network, and has workedtirelessly at its location in Goldstone, Calif., for over 40 years. This historic antenna, which measures 230feet in diameter (70 meters) and communicates with deep space missions, once received NeilArmstrong's famous Apollo 11 message: "That's one small step for man;one giant leap for mankind." Now, this laborer needs replacement of aportion of its hydrostatic bearing assembly, the system that enables the antennato rotate horizontally. The repair will be no mean feat: It involves lifting 9million lbs (4 million kg) of delicate scientific equipment 0.2 inches (5 mm),in order to allow the replacement of the steel runner, walls and supportinggrout, which has never been done before. The $1.25 million upgrade is expected to keepthe antenna working for 20 years. The Deep Space Network is managed by NASA's Jet PropulsionLaboratory (JPL) in Pasadena, Calif.
"This antenna has been a workhorse forNASA/JPL for over 40 years," said Alaudin Bhanji, Deep Space Network projectmanager at JPL. "It has provided a critical lifeline to dozens ofmissions, while enabling scientific results that have enriched the hearts andminds of generations. We want it to continue doing so." The task's scale will limit the speed ofrepairs, expected to complete in early November. Workers will also replace theelevation bearings, which enable the antenna to track up and down from thehorizon. The Deep Space Network will still communicate with space missions bymaximizing use of the two other 70-meter antennas at complexes near Madrid,Spain, and Canberra, Australia, and arraying several smaller 34-meter(110-foot) antennas together. NASA built the Mars Antenna when the firstspace missions began venturing beyond Earth's orbit. The antenna was the firstgiant dish designed to receive weak signals and transmit very strong ones farout into space. 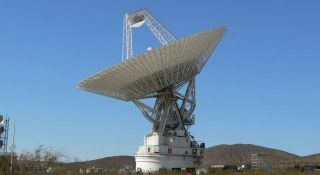 The antenna featured a 210-foot (64-meter-wide) dish when itbecame operational in 1966 (later upgraded to 70 meters in 1988 to enable theantenna to track Voyager 2). Officially named Deep Space Station 14, theantenna picked up the Mars name after its first task: tracking the Mariner4 spacecraft, lost by smaller antennas after its historic flyby of Mars. TheMars antenna has also supported missions including Pioneer, Cassini and theMars Exploration Rovers. The antenna rotating structure, dish andother communications equipment sit on three steel pads above a circular steelrunner, oiled by a hydraulic system. After decades of constant use, oil seepedthrough the runner joints, degrading the structural integrity of thecement-based grout supporting it. Rather than constantly adjusting shimsunderneath the runner to keep it flat, Deep Space Network managers decided toreplace the whole runner assembly. "The runner replacement task has been in developmentfor close to two years," said JPL's Peter Hames, who maintains thenetwork's antennas. "We've been testing and evaluating modern epoxygrouts, which were unavailable when the antenna was built, updating the designof the runner and designing a replacement process that has to be performedwithout completely disassembling the antenna."